You recognize the place before walking in, even if you’ve never been, the bell nailed above the door singing your arrival. Typically, there’s some form of furniture suffocated in glittering vinyl, a black-and-white checkered floor (how did this dizzying pattern ever become an American staple?) and a countertop that, despite hundreds of daily elbow encounters, remains whistle-clean. Whether situated in the farthest reaching corner of Nebraska or smack-dab in downtown L.A., there’s no denying that a diner’s a diner. Despite the thousands dispersed around the country, their shared and enduring promise lies in mugs of mediocre diner coffee that we are helpless to resist. The beginning of the 20th century marked when Americans first decided we quite liked diners. It was about expediency and cost, and our recent ancestors found themselves fond of such things. At 25, I missed the golden era of the diner by a long shot. 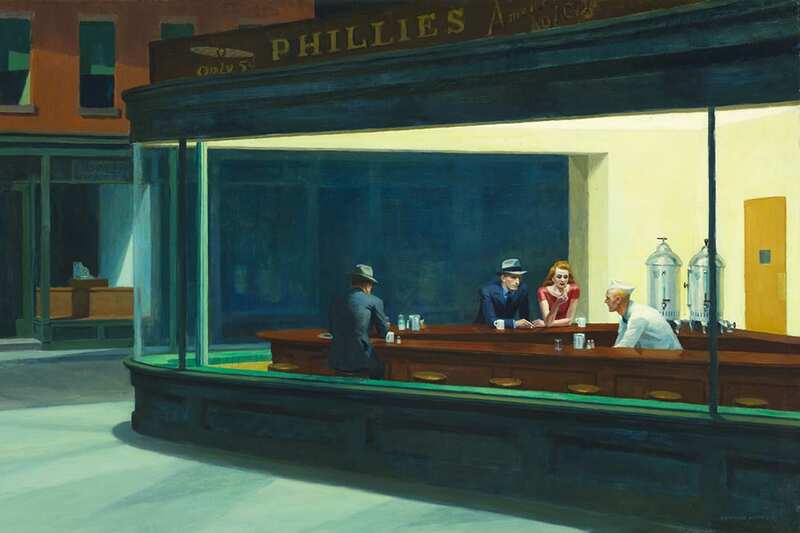 The first of such institutions I crossed paths with hung on a wall in my childhood home: It was a reprint of Edward Hopper’s famous painting Nighthawks. After passing it innumerable times, I eventually came to notice the tell-tale white mugs, undoubtedly filled with coffee, flanking each figure seated at the counter. I was eager for the day I too could elegantly waste hours alongside such a mug, its chubby handle thicker than necessary, leaving room for only a finger or two, and its body slightly pinched at the waist. I became acquainted with diners and their drinks as I got older. On family road trips my parents would pull off at the 59er Diner, buried in Washington’s wilderness, to quash any backseat sibling quarrels with a silencing straw plunged into the depths of a frighteningly large milkshake. This is where I trace my love of kitsch to, contentedly sucking down a banana shake beneath the smoldering eyes of a two-dimensional, cardboard James Dean. Can you blame me? What matters is that the coffee is hot and cheap and accessible, not how long the glass pitcher has been sitting over a slow burn, or the fact that the beans were probably rudely awakened from their long slumber is a sealed bag somewhere. Several years later came coffee. During high school, I lazed about on Sunday mornings with friends, daring each other to order the infamous 12-egg omelet at Beth’s Cafe off Highway 99 in Seattle (ultimately none iron-stomached enough for the task). 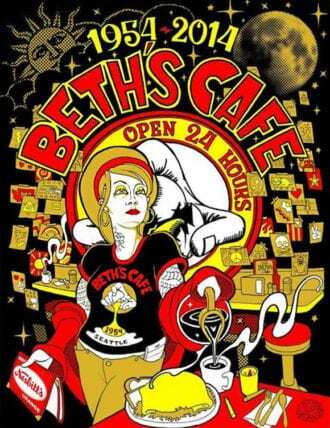 Coffee wasn’t a habit yet, but I would still order it at Beth’s. Squeezed in a booth that brazenly displayed its age, I instinctively felt incomplete without a glossy white porcelain mug of coffee in my hands. The familiar rounded glass pitcher sat near the register, filled with astringent, black coffee. It waited unbothered until the bell’s chorus signaled someone in need. And when called upon, up it went—its plastic handle a shade of orange I once thought exclusively reserved for construction sites, and its shape built for mindlessly grasping while carrying on conversation. There was nothing special about the coffee itself, but it still felt like taking a steaming sip of America’s past. Celebrating Beth’s Cafe’s 60th Anniversary in 2014. | Artwork by James Nielsen. The silver screen continued to grow my soft spot for diner coffee throughout my teens. Watching Agent Dale Cooper, somewhere in Washington, pensively bring his lips to his own spotless mug at the Double R Diner no doubt stirred something in me. Tarantino’s best drama always took place in a diner, usually over coffee, and I appreciated that. Even Edgar Wright’s Baby Driver and its homage to Detroit’s old-school diners roiled the familiar desire within me. What matters is that the coffee is hot and cheap and accessible, not how long the glass pitcher has been sitting over a slow burn, or the fact that the beans were probably rudely awakened from their long slumber is a sealed bag somewhere. Maybe it’s the neon lights that our more primal instincts return to, promising us bottomless warmth delivered in that unmistakable mug. A blinking beacon reminding us we aren’t alone, 24 hours a day. It’s safe to attribute some blame for our soft spot for diner coffee to our nostalgic inclinations; entering a diner feels like stepping foot in a one-horse town where no one knows your name, a quick trip to the Wild West. Or perhaps it’s the implication that enjoying a diner coffee likely means travel and adventure, some Badlands-esque escapade of love and high crime. Probably deep down we all want to drive roofless sports cars and motorcycles. Now I brew Chemex at home, almost exclusively drink espresso when out and always buy fresh beans from local roasters. Yet even as we emerge gasping into coffee’s continuing waves, tote origin stories as though they were our own, diner coffee continues to represent the democratization of the stuff, an iconic symbol of what we like to say America still stands for. It is a no-man’s land, where truckers sit alongside lawyers, each savoring a mug of coffee that’s certainly nothing to write home about. Whenever I find myself on the road, I always stop for that white cup of watery coffee and relax into the small scene, momentarily finding myself more connected to the past than the present.